The Hoosier Kitchen Cabinet-“Saves Steps”! Staying at the William Allen White cabin at Rocky Mountain you could almost think you were living in the early 20th century. Built in 1887, it was the summer home for the famous Kansas newspaper editor and writer. In present day form it had a few modern conveniences—running water, electricity, lights. No phone, no internet, no real cell phone service. 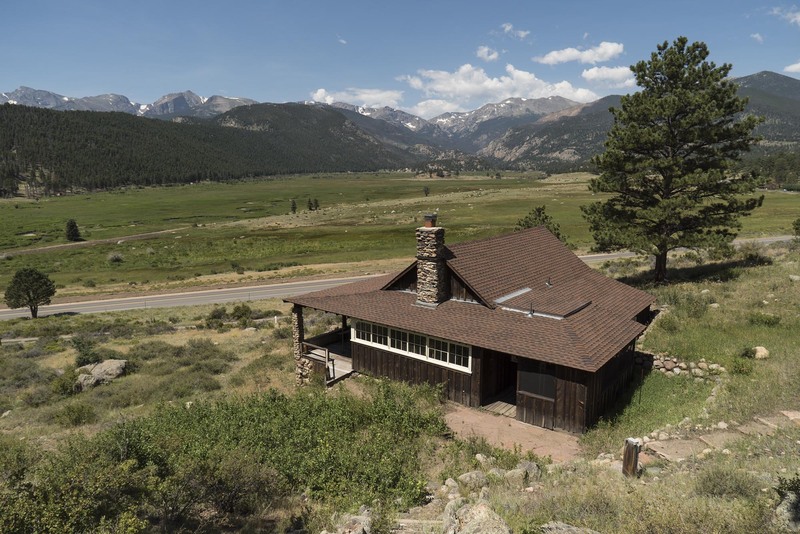 The beautiful view of Moraine Park was occasionally interrupted by the noise of internal combustion engines from Bear Lake Road, which was below the cabin. 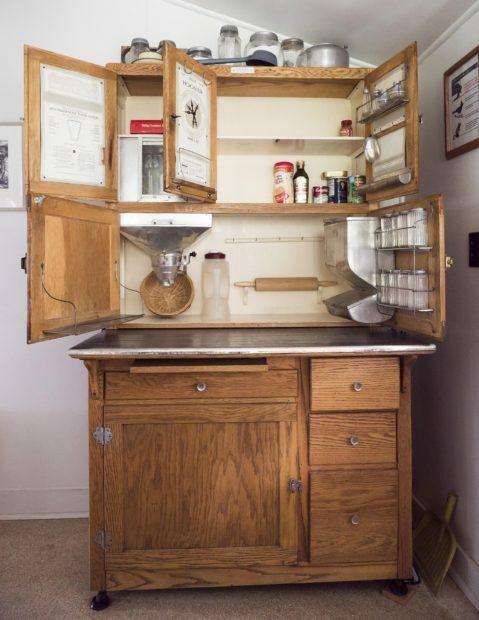 Best of all was the Hoosier Kitchen Cabinet (“Saves Steps”). It really looked like an original from the 1910s or 20s. 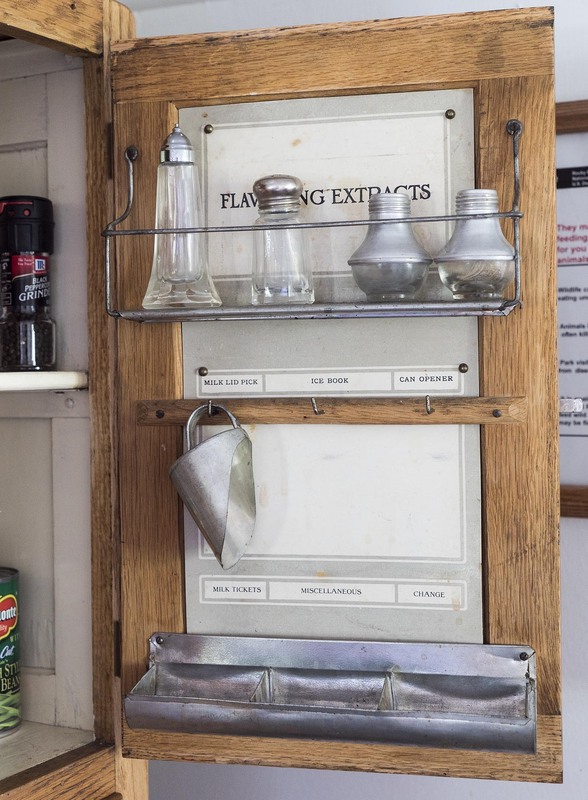 It was a multipurpose device where many things related to meals could be kept or worked on. 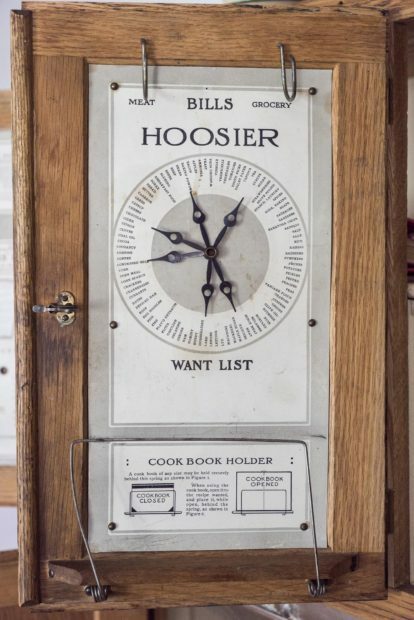 Click here for some fascinating information on the Hoosier. The tall wood cabinet had two large top shelves, drawers and storage and possibly a zinc workspace. What looked like a flour mill was integrated into the two top shelves. 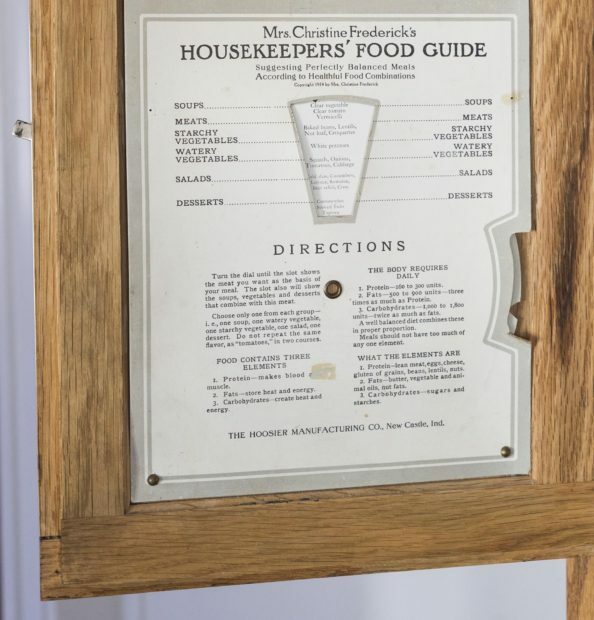 Inside each door were detailed directions, instructions and places to put things like your cook book or ice book. Mrs. Christine Frederick had her “Housekeeper’s Food Guide”, “Suggesting Perfectly Balanced Meals According to Healthful Food Combinations”. Click on each photo to see the detailed suggestions and instructions. Mrs. Frederick has your complete diet planned and an explanation of the elements that make up food, what those elements are and what your body requires. Moveable hands on the Hoosier Want List covered most everything you’ll need, as long as you only need six items at a time. Door for Flavoring Extracts, etc. One door had racks for small bottles or Flavoring Extracts. Below those you put your ice book, which I found was a book of tickets for blocks of ice, bought from an ice company, of course. And a milk lid pick (not in the picture), which looks to be a device to open up the old glass bottles of milk. They really thought of everything. We hated to leave the cabin and the park, but early on Aug. 4 we set out on the road for our journey south through Colorado.